March 23, 2012 10:00 A.M.
Ontario has chosen to take a new approach to regional transportation in northeastern Ontario by winding down the Ontario Northland Transportation Commission (ONTC). This decision will allow the government to protect investments in northerners' health and education systems while balancing the budget by 2017-18. Since 2003, the government has worked hard to make the ONTC viable by increasing funding by 274 per cent. However, demand for its services has stagnated. Also, the current subsidy on the Northlander train is $400 per passenger, and no longer affordable. Government funding has increased from $28 million annually in 2003-04 to $103 million this year. Ridership has remained stagnant at about 320,000 rides a year. Sales revenues have declined from $140 million in 2005 to just over $100 million this year. Private buses serve most of the same communities. There will be no immediate changes for ONTC services or employees. Government funding to the ONTC has increased by 274 per cent over the last nine years from $28 million annually to $103 million this year. Since 2003-04, the government has invested $439 million in the ONTC to help it become viable and self sustaining. The government remains committed to ensuring that northern communities and industries benefit from a viable, efficient and sustainable transportation system. The Growth Plan for Northern Ontario features a "Multi-Modal Transportation Strategy," which includes the development of an integrated air, rail, marine and road strategy. About the direction for an integrated transportation strategy in the Growth Plan for Northern Ontario. This document was published on March 23, 2012 and is provided for archival and research purposes. 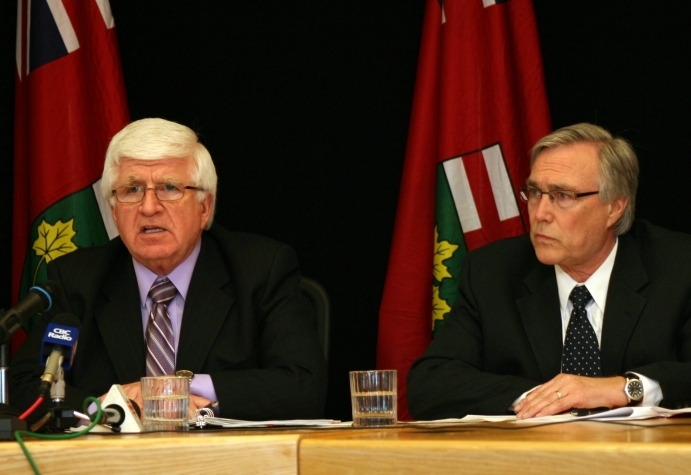 Northern Development and Mines Minister Rick Bartolucci (left) today announced that Ontario has chosen to take a new approach to regional transportation in northeastern Ontario by winding down the Ontario Northland Transportation Commission (ONTC). Joining the minister for the announcement was ONTC Chair Ted Hargreaves.